Chelsea will find it hard to repel Barcelona‘s latest offer of 73 million euros for Willian Borges. Despite being almost 30 years of age, the Catalans are not giving up in their pursuit of the Brazilian. On Friday, Sky Sports reported a raised offer of 61m euros, Barcelona’s second proposal. The Daily Mail went further on Saturday and reported that third attempt of 73m. 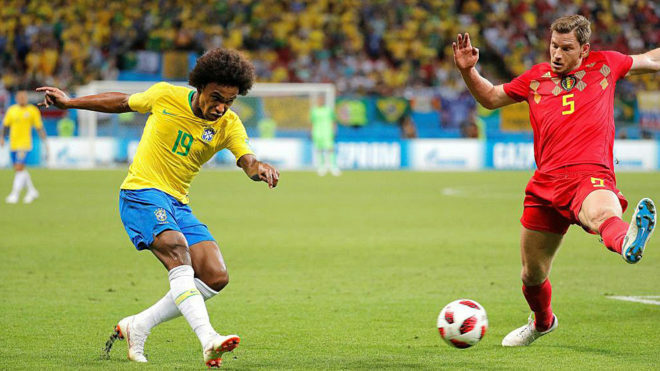 Willian, who is currently on holiday with his family after having played at the World Cup, would cover the failure of not signing Antoine Griezmann and would add more goals than Paulinho, with whom he shares representatives. Chelsea, who won’t play in the Champions League this year and have just changed coaches, won’t make the move easy, however. The Brazilian scored Chelsea’s goal at Stamford Bridge (1-1) when Barcelona played there last season, and also hit the post twice. “He is a very dangerous player,” Ernesto Valverde said at the time. Almost a decade ago, he was wanted by Pep Guardiola when at Barcelona. In 2009, the Catalan club studied recruiting him from Shakhtar Donestk, his first European football destination.